Feeding oneself in the winter is hard. It's cold and you get awful hungry. You wanna eat hot food for dinner and breakfast. But you don't want to spend a ton of time cooking. For me, anything that requires more than boiling water (simmering, cooking, frying) is relegated to summer or hut trips. Or very special occasions. High, cold, chaotic. 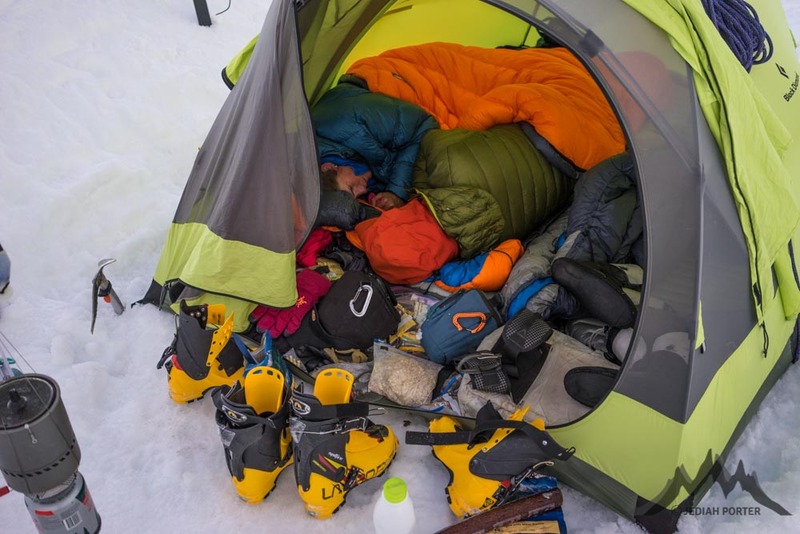 Camping in tough conditions, whether winter in the Rockies or 19,000 feet in Peru (as shown here) is exhausting. Simple food streamlines the whole process. That leaves "just add water" options for efficient and comfortable fueling in the winter (or up high in spring expedition season). Instant oatmeal and commercially marketed "freeze dried" meals are easy and obvious. And they each have their place. But there are other options. Whether your palate or budget won't tolerate these standard choices, I've got some ideas for you. Rice noodle instant soup. My favorite breakfast is the Thai Kitchen brand noodle packets. Protein drink powders. Consumed hot, with powdered milk as a base, this can be almost a meal on its own. Cheese sticks, nuts, bars, etc. Dinner is a little easier. Now, of course, any of these meals can also be consumed at breakfast. But convention is convention. For dinner, in the winter, I do three parts. First, a soup course. Then a main course that is some some starch (either flavored/salted with a dedicated flavor packet or with a bouillon cube), and some protein. Mix and match as you see fit. Instant Soups. None of these are marketed as "instant", but I can tell you that they all hydrate just fine, up to 19000 feet or so. "Noodle Soup" packets. Available in a box of two packets in most grocery stores. Lipton is the brand name, and most stores have their own brand too. "Onion soup and recipe mix". Minute rice (truly minute rice. Not the boil-in-bag kind nor the kind that requires even 5 minutes of simmering). Flavor/salt with bouillon. Instant stuffing. "Stove Top" style. Just add water. Already flavored. Instand Mashed Potatoes. Usually already flavored.